This diminutive lepiotoid mushroom is widespread and common, but not often collected. 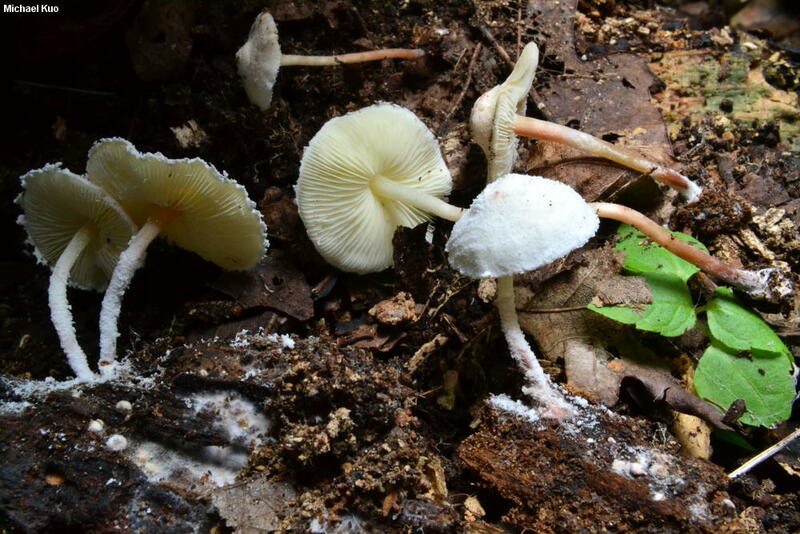 Like other lepiotoid mushrooms it features gills that are free from the stem, and a white spore print. When fresh and young, its snowy white cap and stem are covered with a granulated, powdery material that is easily rubbed off. The stem becomes more or less bald fairly quickly, and begins to turn reddish pink from the base upward. Under the microscope the granulated cap covering is composed of a layer of inflated, round-ish cells; other identifying microscopic features include the presence of clamp connections, the small, cylindric spores, and the absence of cystidia. Lepiota seminuda is a former name. Cystolepiota sistrata, as it is applied by many authors, is a synonym. Ecology: Saprobic; growing alone or gregariously in hardwood and conifer forests, in humus or from well-decayed wood; late summer and fall; widely distributed throughout North America. The illustrated and described collection is from Illinois. Cap: 1-3 cm; convex, expanding to bell-shaped or broadly convex, with a broad central bump; dry; covered with a powdery, granular dusting; white, developing reddish to pink spots; the margin not lined, hung with powdery veil remnants. Gills: Free from the stem; close; short-gills frequent; white, becoming yellowish white. Stem: 30-40 mm long; 1-2 mm thick; equal; when fresh and young covered with powdery material like the cap; becoming nearly bald; white when young, becoming reddish to pink from the base up; basal mycelium white and copious. 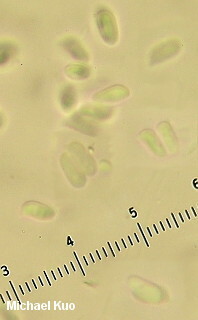 Microscopic Features: Spores 4-5 x 1.5-2.5 µ; cylindric to long-ellipsoid, or occasionally somewhat irregular; smooth; hyaline in KOH; yellowish in Melzer's. 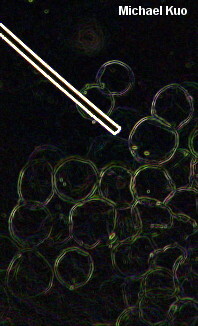 Basidia 4-sterigmate; to about 18 x 5 µ. Hymenial cystidia not found. Pileipellis a cystoderm of subglobose, inflated elements 20-30 µ wide, hyaline in KOH. Clamp connections present. REFERENCES: (Lasch, 1828) Bon, 1976. (Kummer, 1871; Saccardo, 1887; Smith, Smith & Weber, 1979; Arora, 1986; Phillips, 1991/2005; Breitenbach & Kränzlin, 1995; Vellinga, 2001g; Miller & Miller, 2006; Vellinga, 2007a.) Herb. Kuo 10101301, 09211501.